Please see the gun terms diagram below for a list of common terms that will be used throughout this manual. If you have any further questions we'd highly recommend asking the AW Community Group on Facebook, or contact us and we'll put you in touch with a distributor that can help. 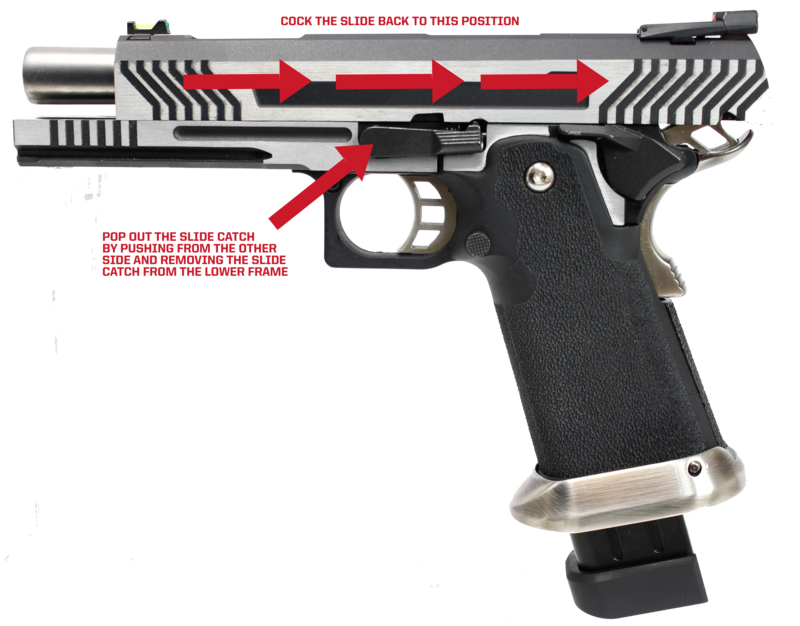 There are some common issues that affect all gas blowback pistols. We've compiled a list of them in the table to the right and provided details on what you should do to troubleshoot if the issue you're having matches one of those problems. 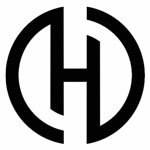 For other issues we'd suggest first asking the AW Community to see if there are any other HX Series owners in there that have encountered the problem and found a solution. If you are unable to find the solution to your problem in the community feel free to email us and we'd be happy to help. Keep your finger off the trigger. 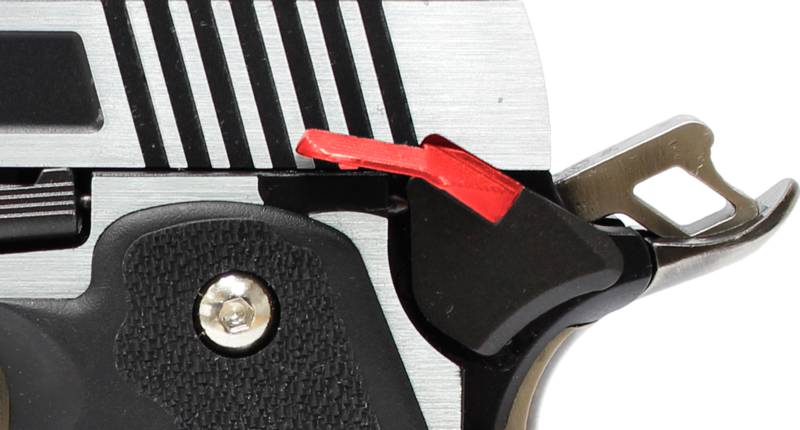 Keep your finger straight and resting on the outside of the trigger guard until you are ready to fire. Do not allow the gun to be visible in a public place. Members of the public and police officers may believe it to be a firearm and act accordingly. Legally it may be an offence to display an air-gun or replica gun in a public place. Keep it in an enclosed transport container/box. Never aim your air-gun at persons or animals. Only aim your gun at a target you can legally and ethically shoot. 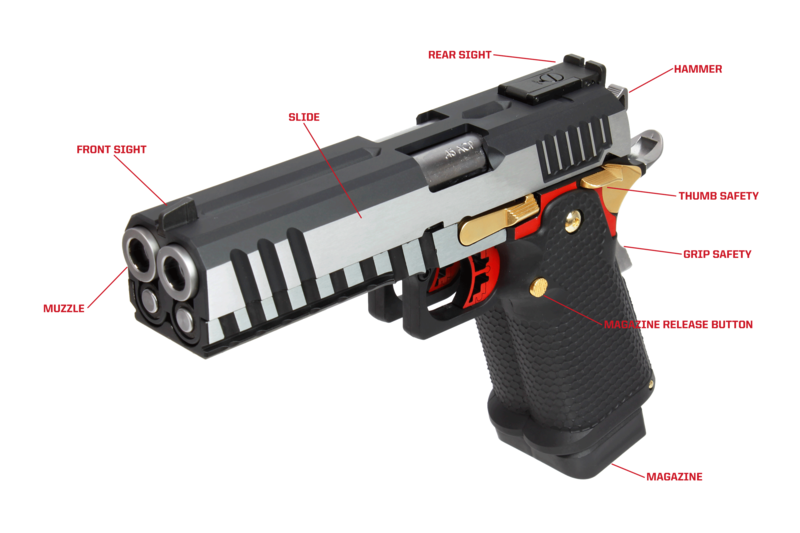 This gun may only be discharged in your own house, on an authorized shooting range or inside enclosed private property. Make sure that no projectile can leave the enclosed shooting area. Transport the gun in a suitable container and keep it out of sight. Treat the gun as if it were loaded until you have done a “P.R.O.V.E.” to ensure the gun is unloaded. Unload the gun and P.R.O.V.E. it to be unloaded and safe before you transport it. P.R.O.V.E. the gun to be unloaded before putting it away for storage. Store the gun in a secure place and store the ammunition and Gas Canisters/CO2 Capsules in a separate secure place. Do not fire at smooth hard surfaces or water because this can cause projectiles to ricochet or bounce back at the shooter. Wear safety glasses when shooting and ensure all persons in the range area also wear safety glasses. Never leave the gun unattended. Put it away in secure storage. Unload and lock the gun's action open before passing it to another person. Do not attempt to modify the gun. Repairs or modifications are only to be carried out by authorized and trained persons such as a gunsmith. Be aware that projectiles from the gun can travel up to 350 metres. Always keep your airsoft guns secured under lock and key and keep out of reach of children. Once firing mode is engaged the slide will be unlocked and you will be able to pull back the slide. 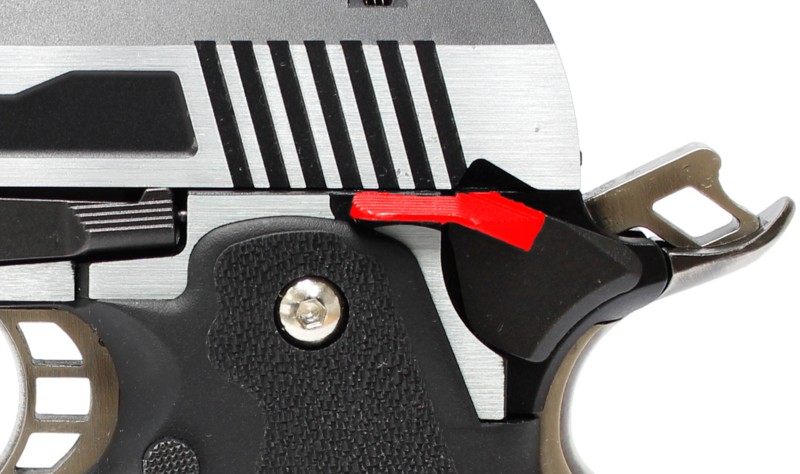 You will now be able to fire by first engaging the grip safety, and then pulling the trigger. Only point downrange once this firing mode is engaged. Make sure muzzle is pointing in a safe direction. 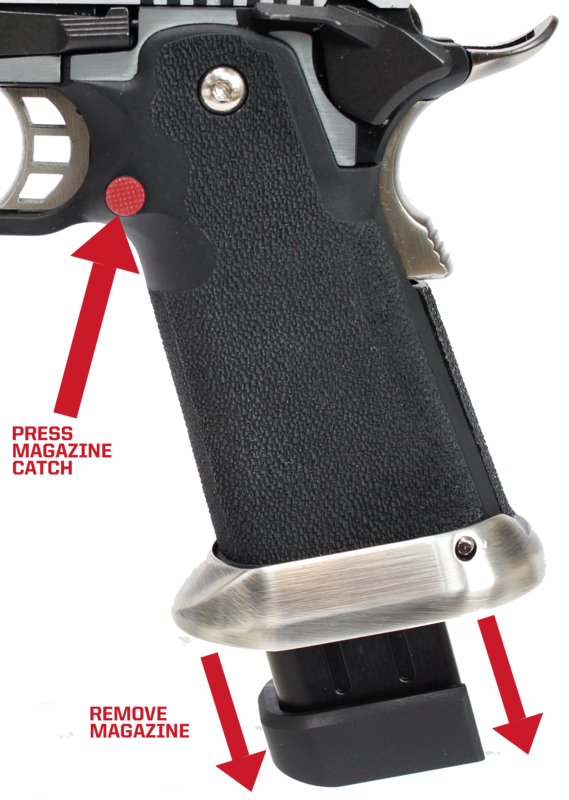 Once safety mode is engaged the slide will be locked in position and you will be unable to fire by pulling the trigger. Only handle the gun when the safety mechanism is engaged. Make sure muzzle is pointing in a safe direction, even when safety is engaged. This mode should be engaged before storing the gun, or while reloading the gun. This section covers the basics of field-stripping your pistol for cleaning, and other general maintenance work. For more in-depth guides on specific subjects, such as replacing parts check out Armorer U.